In an interview Wednesday with "Fox News @ Night," Trump said he wanted to find out what happened to Khashoggi but appeared reluctant to consider blocking arms sales, citing economic reasons. "I think that would be hurting us," Trump said. "We have jobs, we have a lot of things happening in this country. We have a country that's doing probably better economically than it's ever done before." He continued: "Part of that is what we're doing with our defense systems and everybody's wanting them. And frankly I think that that would be a very, very tough pill to swallow for our country. I mean, you're affecting us and, you know, they're always quick to jump that way." 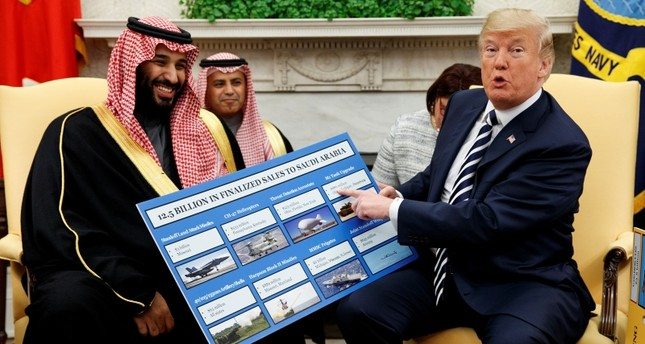 On his first international trip as president, Trump visited Saudi Arabia and announced $110 billion in proposed arms sales. The administration also relies on Saudi support for its Middle East agenda to counter Iranian influence, fight extremism and support an expected peace plan between Israel and the Palestinians. Earlier Wednesday, Republican Sen. Bob Corker, who as chairman of the Senate Foreign Relations Committee has reviewed U.S. intelligence on the case, said it was likely that Khashoggi was killed the day he walked into the consulate. Whatever took place, Corker said, "there was Saudi involvement" and "everything points to them." More than 20 Republican and Democratic senators instructed Trump to order an investigation into Khashoggi's disappearance under legislation that authorizes imposition of sanctions for perpetrators of extrajudicial killings, torture or other gross human rights violations. Sen. Rand Paul, R-Ky., a longtime critic of the Saudi government, has said he'll try to force a vote in the Senate blocking U.S. arms sales to Saudi Arabia. Sen. Chris Murphy, D-Conn., said it would be time for the U.S. to rethink its relationship with Saudi Arabia if it turned out Khashoggi was lured to his death by the Saudis. Khashoggi had gone to the consulate in Istanbul on Oct. 2 to get paperwork he needed for his upcoming marriage while his Turkish fiancee waited outside. Turkish authorities have said he was killed by members of an elite Saudi "assassination squad," an allegation the Saudi government has dismissed. The Washington Post reported Wednesday evening that U.S. intelligence intercepts outlined a Saudi plan to detain Khashoggi. The Post, citing anonymous U.S. officials familiar with the intelligence, said Saudi Crown Prince Mohammed bin Salman ordered an operation to lure Khashoggi from his home in Virginia to Saudi Arabia and then detain him.